Pat wings dry with a paper towel and place in a large bowl. In a medium bowl, whisk together the oil, lemon juice, oregano, rosemary, thyme, cumin, salt, and pepper. Pour over the wings. Mix until completely coated. Cover with plastic wrap, or place in a large freezer baggie and place in the refrigerator for 1 hour or overnight. Using tongs, place the chicken pieces on a baking pan. Place the chicken into the pre-heated oven. Bake for 45 to 50 minutes, until skin is golden and crisp, and the meat is fully cooked. (Juices run clear when pricked with a knife). Meanwhile, in a medium pan over medium-high heat, add the butter, garlic, hot sauce, chicken stock, onion and garlic powders, salt and pepper. Simmer for about 15 minutes until slightly reduced. Remove the chicken from the oven and place in a clean large bowl. 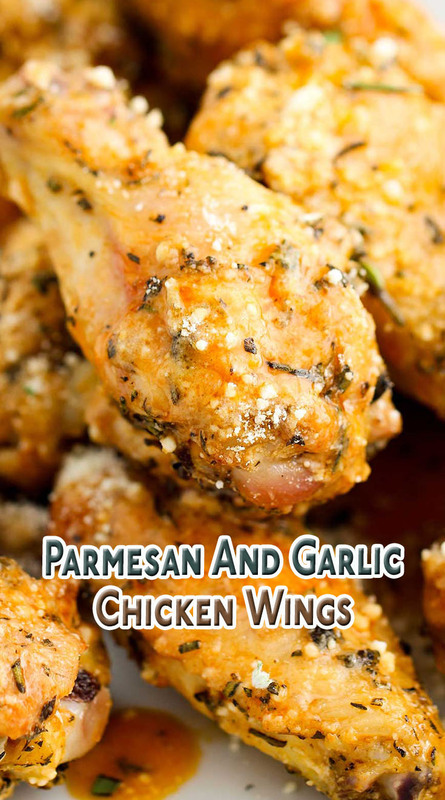 Pour the sauce over the wings and then add the parmesan cheese. Toss well until all wings are coated. Place on serving dish and sprinkle on a little more parmesan cheese and the remaining herbs.